Forgive this brief post from the Department of Self Promotion, but I can’t help being a little pleased that The Economist, the Wall Street Journal and the lovely Longitude books have picked Indonesia Etc. as one of the best books of 2014. I’m thrilled, too, that I’ll get to talk about Indonesia at the glorious Asia Society in New York on Monday December 15 (if you’re in town, please come along). What’s especially fun about the “Best ofs” is that they suggest that the book is as unclassifiable as Indonesia itself. While the Wall Street Journal says it is one of the ten best books of the year in the broad category of “Non-Fiction”, The Economist chose it as one of the nine best books about politics and current affairs. Longitude, on the other hand, thought it was one of the ten best travel books of the year, and since they specialise in great books about places and journeys, that’s a compliment indeed. 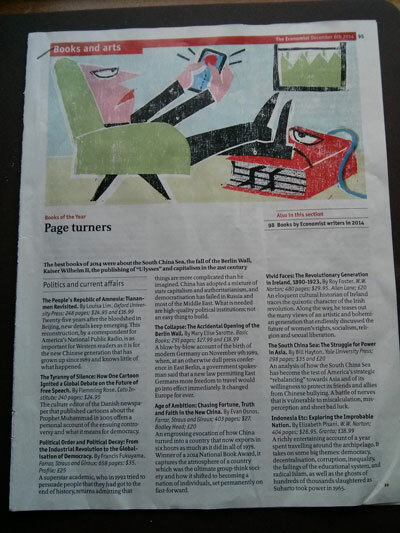 (It happens that The Financial Times agreed with them while picking it’s best Travel reads in the summer.) I’m hoping that the different views reflect the kaleidoscopic nature of the book, as well as of Indonesia itself. But enough bragging from me: its for readers to decide what manner of beast this is. The multimedia (“enhanced”) ebook contains videos, slideshows, photos and some odds and ends that I cam across that I thought would amuse readers. I’m not the world’s best photographer or video editor, I admit, but Indonesia is so visually compelling that it makes up for my inadequacies. Here’s a taster video that mixes travel and politics. At three and a half minutes this is the longest of the videos embedded in the multimedia version of Indonesia Etc. I somehow just couldn’t squeeze this story of decentralisation, cultural reinvention, Big Man politics, campaigning transvestites, dancing cops and edge-of-the-archipelago eccentricity into anything shorter. 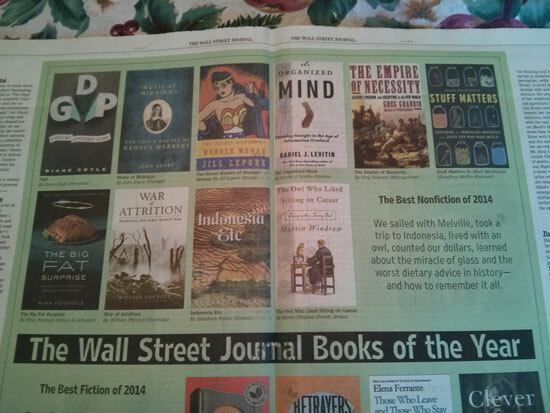 5 Comments on "Best Books 2014 lists underline Indonesia (Etc. )’s diversity"
Indonesia Etc by Elizabeth Pisani gives the best insight into the complexity, richness and huge variation of the country without being overloaded with facts that are easily accessible elsewhere. It’s the kind of journey every traveller would love to do but not brave and even maybe foolish enough to undertake. In the same vein as self-promotion you may want to turn on follow on you Facebook page or alternatively have a public page where people can keep abreast of any developments. By the way good book. Lucky me. I just found this page seconds after reading about it in Indonesia, Etc.